It's the ultimate holiday tradition from the youngest to the seniors in the family. 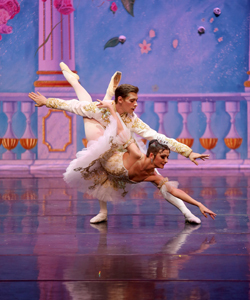 See Moscow Ballet's Great Russian Nutcracker and create memories for a lifetime. The company of almost 40 dancers is the only internationally touring ballet group to perform to critical acclaim in over 75 North American cities annually. The renowned, award-winning principal dancers and corps de ballet thrill audiences with their expertise, dramatic expression and stunning leaps, turns and drops. The production is known for its dedication to world peace: naming Act II the "Land of Peace and Harmony;" featuring a rose shooting cannon and a stunning "Dove of Peace" with a 20' wingspan. All ages feel the spirit of the season at the Great Russian Nutcracker through the romantic costumes and shimmering backdrops splashed with highlights of Russian history. Tickets are on sale now for Moscow Ballet's celebrated Great Russian Nutcracker on most cities on the 2015 North American tour!